A couple of days ago I reached 10 000 page views, a milestone. I want to thank everybody that read my blog, saw my work, gave me feedback, even the people that complained; Thank you all, the mistakes are only to learn from. This blog is something I'm proud of, the compliments and extra pageviews made my day; Especially the ones from DutchDamage. Special thanks to user 'Boy Zonderman' for posting my link in the blog section! Keep it up! I've made a illustration about these days; My girl is starting to paint also, she even got a blackbook and markers.. We already painted her first piece, and the sun is shining. It is getting warmer and warmer. Everybody's happy. Those things make me think about my future in a bright way; Can't I get up higher? Can't the blog get bigger than it already is now? Offcourse! Let's do that! I'll keep sketching anyway but this is like piece that tops it all. This time we've got a flying backpacker. He has a painting-mask on, and he's leaving red drips everywhere. The guy that is confident about every step he makes, but also does whatever he wants to do. 'Is the sky really the end?' This one is made with ink and paintmarkers, and finished off with fineliners, grey shadowing and some highlights. 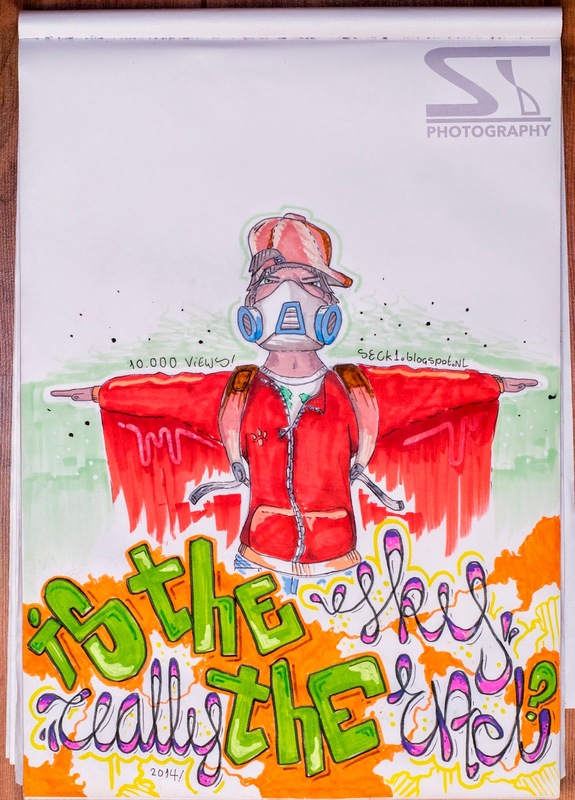 Enjoy this proud graffiti writer illustration!